In October 2012, Georgia Webber was diagnosed as an “abusive talker”—hurting her throat by talking way too much. She was ordered to stop using her voice for six months. 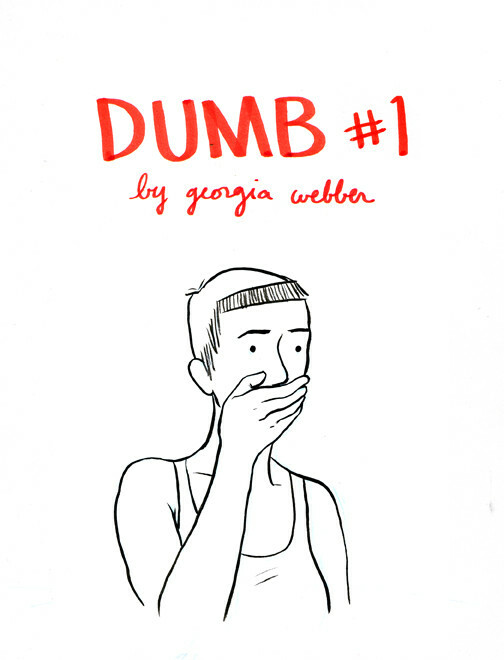 As she made enormous life adjustments, she also decided to document the decrescendos of her day-to-day life in DUMB, a six-part comic project that’s partly released. Vancouver native Tobin Louise Reimer is a cool cat who draws like a human —or maybe it’s the opposite. Stop at her table to wash your eyes from the ugliness of life; she has an excess of dreamy colours hanging from the tip of her brush. Poetic zines and prints aplenty will be found there. Julie Delporte sharpens pencils for a living. Sort of. The French, Montreal-based comic artist recently published Journal (Koyama Press) based on the personal visual diary she kept through 2011-2012. Her book says a lot with few words and simplistic, colourful pencil lines. Everything just naturally flows on the page, taped drafts and unashamed corrections. Her work is a sincere, intimate journey full of beautiful silences. Concordia’s student-run Lit magazine makes its appearance at Expozine, bringing with it poems, fiction, non-fiction and visual art, all the hard work and self expression of fellow Concordia students. Stop by their table and snag a copy of your own—and they’re always scouting for new submissions, too. These artists combine whimsical colours, characters and images with political statements that make you reflect on the wicked ways of our weird world, while still bringing a smile to your face.